Acknowledged the policy advice initiative for CELAC as a genuine opportunity for supporting CELAC countries in structuring their national R & I priorities and support developing regional and bi-regional cooperation. A new round of expression of interest is launched by end of 2017. The intra-CELAC workshop on Research Infrastructures (RI) in Uruguay (27-28 Sept) was seen as a critical step towards the development of a regional approach and a broader understanding on the different instruments and programmes available in CELAC, open for transnational cooperation. 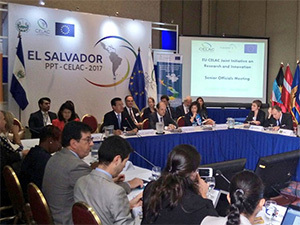 The first EU-CELAC meeting of the working group on RI will take place in Brussels in 2018, based on nominations of representatives from both EU and CELAC countries. Discussed how best to capitalise on the opportunities provided under the new Horizon 2020 work programme for 2018-2020, targeting the region of CELAC, namely in the field of health and sustainable urbanisation. In this context, senior officials agreed to set in place a task force on Sustainable Urbanisation, as well as to explore how best to strengthen cooperation in new areas such as sustainable agriculture and transport. Finally, the SOM highlighted the need of a research portal to articulate better the connection among CELAC countries but also to act as a structuring element of their participation in all three pillars of the Common Research Area. The Knowledge week was also composed of a set of information and back-to-back research related events such as a Horizon 2020 and Erasmus + information day, co-organised jointly with DG EAC, as well as a Workshop on Sustainable urbanisation and a Horizon 2020 training for researchers and NCPs. Addressing the sustainable development goals under Horizon 2020 and the Common Research Area were at the heart of the Academic and Knowledge Summit (5-6 October), a congress of universities of more than 300 participants from both regions. The Summit concluded with a Declaration calling for further integration and highlighting the Common Research Area as the existing policy framework supporting academic and scientific cooperation between the EU-Latin American and the Caribbean.